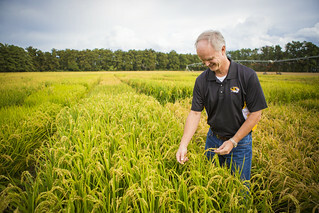 Gene Stevens, Crop Production Specialist at the Fisher Delta Research Center stands in a field of pivot-irrigated rice. Research by Stevens has looked at how varieties respond to overhead irrigation versus flooding. The research has helped producers around the world grow rice where they may have not in the past.